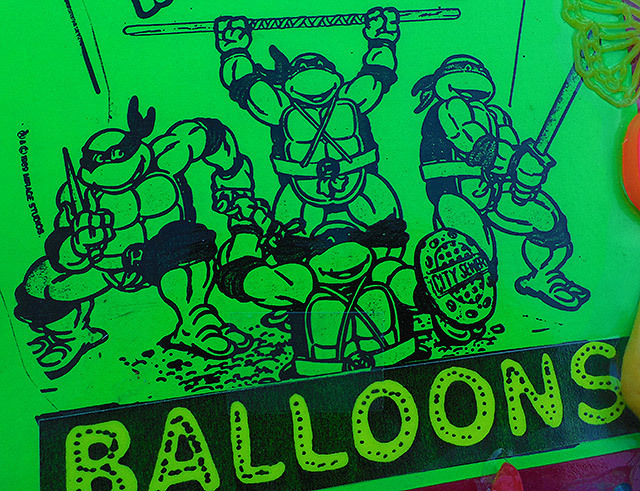 Vintage Vending #19: TMNT Balloons! | Dinosaur Dracula! 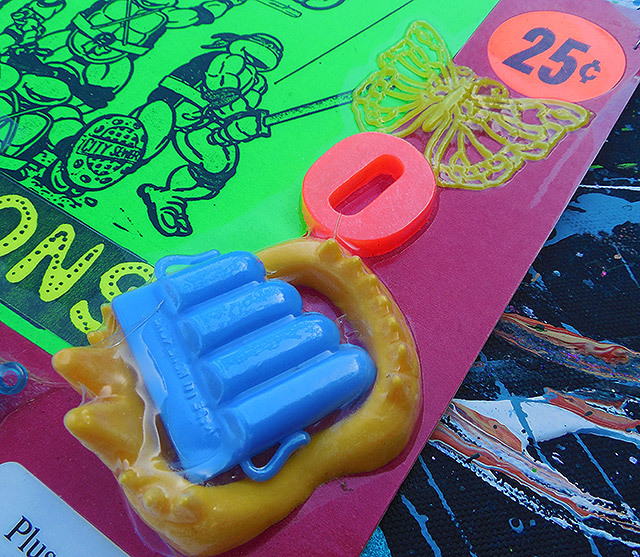 It’s been over four months since the last edition of Vintage Vending. Let’s fix that. HERE ARE BALLOONS. 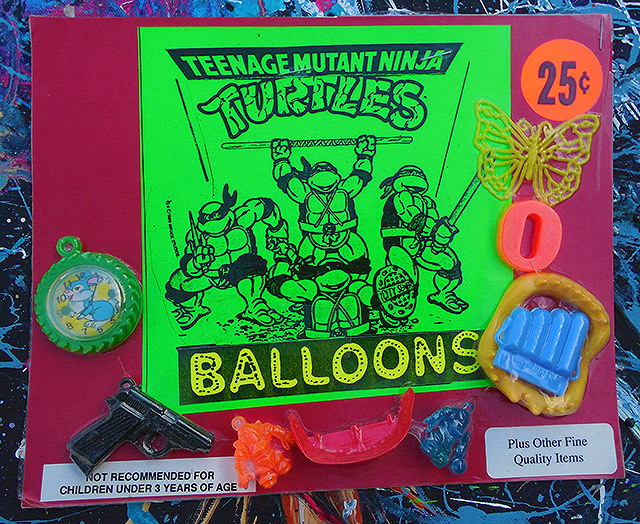 Teenage Mutant Ninja Turtles balloons, even! 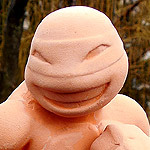 This is from 1989, when literally everything branded with a Ninja Turtles logo was a must-buy. 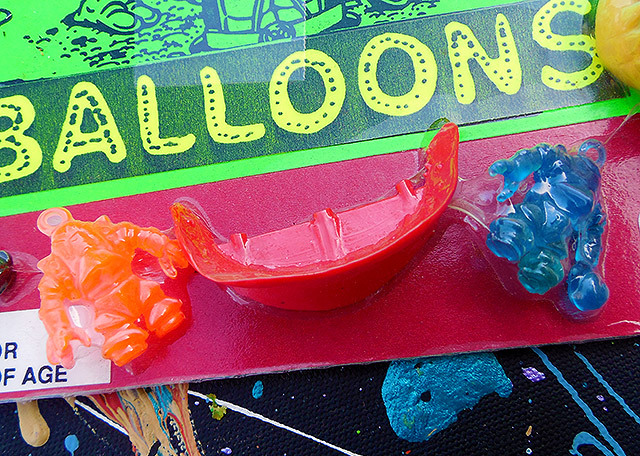 Though the teaser card lacks a sample, we can assume that these were green balloons featuring that same piece of art. The people behind this knew where their bread was buttered, evidenced by how little thought they put into the remaining prizes. If you ignore the balloons, this is easily the worst assortment yet seen on Vintage Vending. If there’s a world of difference between misfiring and just not trying at all, a tiny-sized magnet shaped like the letter “O” comes from motherfucking Mars. “THE EARTHBORN FOOLS WILL NEVER NOTICE,” says M’rriva of Mars. 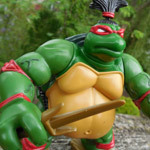 “THEY WILL FOCUS ON TURTLE BALLOONS AND BE BLIND TO ALL ELSE.” Then M’rriva vomits into the mouths of everyone around him, because he’s a martian and that’s what they do. The “O” magnet is the worst offender, but the other prizes aren’t much better. There’s a kazoo that can only be played properly if your mouth is the size of a quarter. 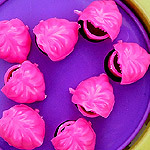 If yours is, lucky you, because that’s also the mouth-size required to wear the plastic monster fangs. As for the butterfly, I suppose he’s inoffensive enough. But I also suppose that a child who dreams of Ninja Turtle balloons would be maddeningly dissatisfied with a weirdly skeletal rubber butterfly. I guess that makes the butterfly situationally offensive? The only non-balloon prizes that were kinda cool was this pair of… God, I don’t know. Robots playing sports? 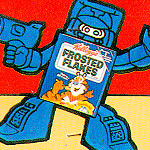 They’re little, they’re made of translucent rubber, and I really wish they were fruit snacks. Skipping past the tiny red lips and plastic gun, I stumble upon… this. – It’s a fake pocket watch that was intended to be worn as a necklace. – The Disney-esque bunny, with its punky blue fur. – The fact that the time is permanently set to 8:06, which, I swear to God, is THE EXACT MINUTE IT IS RIGHT NOW. That is FREAKY. I feel like I’m in an episode of Tales from the Darkside. A bad one. – Oh, and the two little metal balls swimming around the inner chamber. I think you’re supposed to roll them into the holes on the rabbit picture. 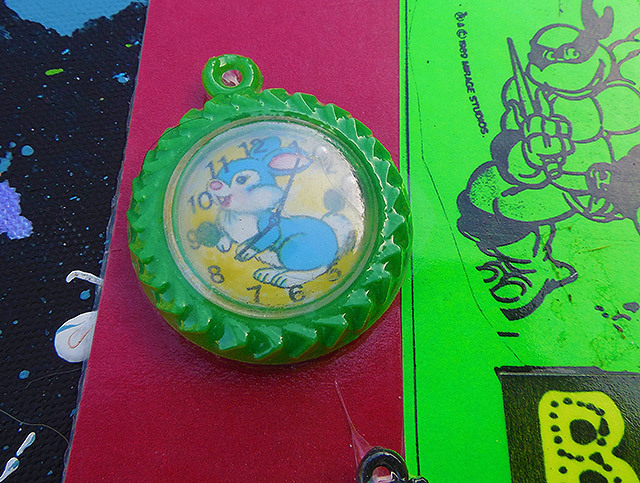 Which makes this faux pocket watch necklace not just a faux pocket watch necklace, but also a GAME. 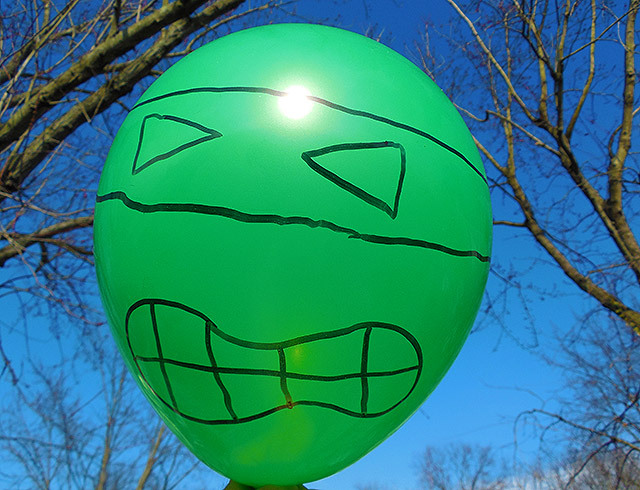 That… that actually might be better than a TMNT balloon. I have no way of knowing if they were an “official” release or not. 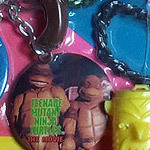 There were certainly TMNT balloons in 1989, but this also could’ve been a case of a seedy company stealing popular art and making Christian cross fingers at all licensing contracts. I’m so aggravated that they didn’t stick one lousy balloon on the teaser card. I got a tiny kazoo, a rubber butterfly and an alphabet magnet, but none of those things matter when I know what should’ve been. Sometimes, you gotta take care of yourself. Why am I surrounded by Sharpies at all times, except when I actually need one? Social media push #24434! Be sure to follow Dino Drac on Twitter, Facebook and Instagram. Go for a swim with Mummy Shark, too.